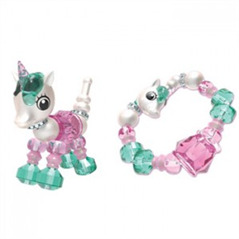 Animal lovers can get their bling on with Twisty Petz, a new line of two-in-one gemtastic animals that go from figure to bracelet and back again with just a twist. There are more than 70 to collect featuring all kinds of animals from turtles, cats, and bunnies to pandas, unicorns, and zebras. And some of the pets are metallic, rainbow, neon, pastel, pearl, golden, silver shimmer, and fuzzy. All you do is pull the head and tail of the animal figure to release and insert the tail into the head to create an elastic bracelet. To turn it back into a figure, put the front round bead into the body and twist the front legs, and then do the same with the back round bead and back legs. Twisty Petz are available to collect in individual Single Packs, in Three-Packs with two pets revealed in packaging and one hidden, and in Twin Babies Four Packs that include two sets of twins, a charm, and a case. The twins are smaller than the original Twisty Petz, so you can connect two twins to form one bracelet. The case serves as storage for taking the twin babies with you on the go. Each pack is sold separately and comes with a collector's guide. These are so cute, so blingy, and so fun. Kids who like animals and wearing jewelry will like collecting all the different animals in the first series of Twisty Petz and showing off their collections either on display in their rooms or on their wrists. You can even attach these to a purse or bag and use them as pretty decoration that way. Twisty Petz are for ages 4 and up. Kids who like animals and accessories will enjoy collecting and wearing Twisty Petz. Don't worry if you don't get the twisting part right the first time. It took us a few tries when we were getting started, but once you get the hang of it, it's easy to do. The Twisty Petz Single Packs are $5.99, while the Three-Packs are $14.99 and the Twin Babies Four Pack is $9.99. 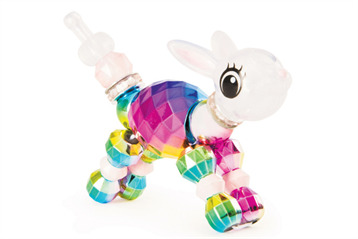 Spin Master’s Twisty Petz are “gem-tastic” and “bling-tastic” animal companions that, with a simple twist, transform into a cool bracelet that kids can collect, stack on their wrists or transform back into animals that they can use for imaginary, open-ended play by themselves or with siblings and friends. 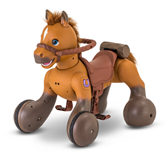 This toy easily allows kids as young as 4 to express their individuality and style, both in groups or on their own.